Do you remember the harrowing rescue of the Little Boars and their coach? I was captivated by the story of the Thai football boys from the flooding waters in the dark caves of Chiang Rai, Thailand. As the story unfolded, the boys’ coach was constantly on my mind. In the midst of extreme danger, he continued to inspire hope in the kids to persevere, to be resilient and to fight for life. He did this day in, day out, hoping for a rescue. Unbeknownst to him, on the other side of the cave was a global team of people working around the clock to free them. Hundreds of people participated – Government leaders. Experts. Thai Navy Seals. Engineers. Thai Royal Family. Water pumping and drilling teams. US air force rescue specialists. Cave divers from the UK, Belgium, Australia, Scandinavia. Rescuers from China, Japan, Sweden, Myanmar, Laos and Thailand. Rescue dogs. Elon Musk (lol). Cleaners. Cooks. Journalists. Doctors. Nurses. Each person did their part and joined together to free these kids who were most vulnerable (some of the kids’ citizenships are stateless ethnic minorities living in Thailand). During the rescue, many were not sure if it would be successful with only a glimpse of hope. However, “in the end, that tiny bit of hope became reality”, as rescuers and countries united against the clock to rescue this football team and their coach. Against all odds, the rescue was a complete success! All the little Wild Boars were rescued, along with their coach. 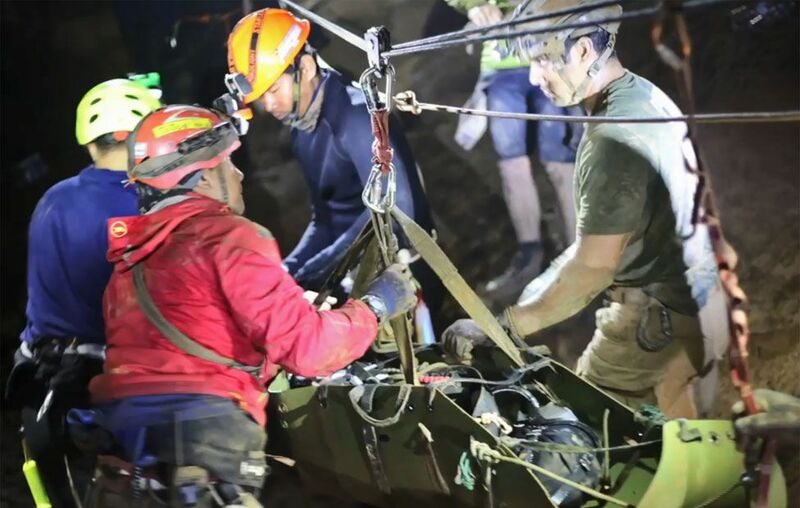 The chain of rescuers in bringing the boys out of the cave. The image that remains in my mind is what I’ve come to see how battling human trafficking must be like. A chain of rescuers joining hands and providing support in every part of the journey to freedom. One such organization in Chiang Rai, Thailand that Barefoot Love was able to sponsor is The Freedom Story. This organization focuses on the prevention of child trafficking and exploitation through culturally relevant programs for vulnerable children. Ten years ago, I was proud to see someone who could see beyond the village. Now they think about things that wouldn’t even occur to me. It’s evidence that the community has changed in a very positive way – from being a vulnerable community to one that is thriving. For our visit, Barefoot Love joined hands with The Freedom Story and taught kids the joy of creativity and created a space for kids to explore their own creativity, learn more about various art skills, and enjoy the process of creating and imagining. On this particular trip, Sarah, an elementary school teacher, volunteered her time with us on this trip, and we got to meet some amazing kids and budding artists in the mix! Ten years ago, I didn’t have the confidence that all of this could happen. I just believed that we needed to do something. From seeing the issues and wanting to be a part of its solution, even though at the time I knew almost nothing about it, I jumped in to learn and with many helping hands we developed the full program. It’s possible for people to do something, if they have passion and the heart for community. It doesn’t matter what the issue is, if they feel like they want to see the solution, even if they might not have the confidence, nor know what to do, they just need to try their best. The change starts when a brave heart takes a first step.